Cities: Capital: Luanda (est. pop. 6.0 million); Huambo (1.5 million); Benguela (1 million); Lobito (1 million). Nationality: Noun and adjective — Angolan(s). Population (2011 est. ): 18,000,000. Angola has not had a census since the early 1970s. Annual population growth rate (2011): 2.034%. Religions (2001 official est. ): Roman Catholic 68%, various Protestant 20%, indigenous beliefs 12%. Languages: Portuguese (official), Umbundu, Kimbundu, Kikongo, and others. Education: Years compulsory: 9. Enrollment (combined gross enrollment for primary, secondary, and tertiary schools, 2004 est.) — 26%. Literacy (total population over 15 that can read and write, 2011 est.) — 67.4% (female 54.2%, male 82.9%). Health: Life expectancy (2011 est. ): total population 38.76 years. Infant mortality rate (2011 est.) — 175.9/1,000. Under-5 mortality rate (2007 est.) — 158/1,000. Work force (2010 est., 7.9 million): Agriculture (primarily subsistence) 80%; commerce, industry, mining, informal, and other 20%. Branches: Executive — elected president (chief of state), vice president, 2 ministers of state through whom other ministers are expected to report, 28 ministers, 21 secretaries of state, and 39 deputy ministers. Legislative — elected National Assembly (220 seats; 3 seats are reserved for Angolans out of the country and remain vacant). Judicial — Supreme Court, Constitutional Court. Administrative subdivisions: Province (18), municipality (164), commune. Political parties: 78 with legal status; in 2008, 5 won seats in the National Assembly. Ruling party — Popular Movement for the Liberation of Angola (MPLA). Opposition — National Union for the Total Independence of Angola (UNITA), Social Renewal Party (PRS), National Front for the Liberation of Angola (FNLA), and the coalition New Democracy (ND). Suffrage: Universal age 18 and over; voting not compulsory. GDP (2010 est. ): $107.3 billion. Annual real GDP growth rate (2010 est. ): 1.6%. Per capita GDP (2010): $8,200. Avg. inflation rate (2010): 14.5%. Agriculture: Products: bananas, sugarcane, coffee, sisal, corn, cotton, manioc, tobacco, vegetables, plantains; livestock; forest products; fisheries products. Industry: Types: petroleum drilling and refining, mining, cement, fish processing, food processing, brewing, tobacco products, sugar, textiles, ship repair. Trade: Exports (2010 est. ): $50.59 billion: crude oil, diamonds, refined petroleum products, gas, coffee, sisal, fish and fish products, timber, cotton. Major markets (2009) — Portugal 19.7%, China 15.1%, U.S. 9%, Brazil 8.7%, France 4.8%, Italy 4.5%, South Africa 4.2%. Imports (2010 est.) — $18.34 billion: machinery and electrical equipment, vehicles and spare parts; medicines, food, textiles, military goods. Major sources (2009) — EU 43.1%, China 17.4%, U.S. 8.5%, Brazil 8.3%, South Korea 6.7%, South Africa 4.2%. Angola is located on the South Atlantic coast of West Africa between Namibia on the south and, with the exception of the enclave of Cabinda, the Democratic Republic of the Congo (D.R.C.) on the north; the D.R.C. and Zambia form the eastern boundary. Cabinda is bounded by the Republic of the Congo (Brazzaville) on the north and east and by the D.R.C. on the south. The country is divided into an arid coastal strip stretching from Namibia to Luanda; a wet, interior highland; a dry savanna in the interior south and southeast; and rain forest in the north and in Cabinda. The upper reaches of the Zambezi River pass through Angola, and several tributaries of the Congo River have their sources in Angola. The coastal strip is tempered by the cool Benguela Current, resulting in a climate similar to coastal Baja California. The hot, humid rainy season lasts from November to April, followed by a moderate dry season from May to October. The interior highlands have a mild climate, with a rainy season from November through April, followed by a cool dry season from May to October, when overnight temperatures can fall to freezing. Elevations generally range from 3,000 to 6,000 feet. The far north and Cabinda enjoy rain throughout much of the year. Estimates of Angola's population vary, as there has been no census since the early 1970s, but it is generally estimated at 18 million. Angola has three main ethnic groups, each speaking a Bantu language: Umbundu 37%, Kimbundu 25%, and Kikongo 13%. Other groups include Chokwe, Lunda, Ganguela, Nhaneca-Humbe, Ambo, Herero, and Xindunga. In addition, mixed racial (European and African) people account for about 2%, with a small (1%) population of whites. Portuguese make up the largest non-Angolan population, with at least 30,000 (though many native-born Angolans can claim Portuguese nationality under Portuguese law). Portuguese is both the official and predominant language. In 1482, when the Portuguese first landed in what is now northern Angola, they encountered the Kingdom of the Congo, which stretched from modern Gabon in the north to the Kwanza River in the south. Mbanza Congo, the capital, had a population of 50,000 people. South of this kingdom were various important states, of which the Kingdom of Ndongo, ruled by the ngola (king), was most significant. Modern Angola derives its name from the king of Ndongo. The Portuguese gradually took control of the coastal strip throughout the 16th century by a series of treaties and wars. The Dutch occupied Luanda during 1641-48, providing a boost for anti-Portuguese states. In 1648, Brazilian-based Portuguese forces retook Luanda and initiated a process of military conquest of the Congo and Ndongo states that ended with Portuguese victory in 1671. Full Portuguese administrative control of the interior did not occur until the beginning of the 20th century. Portugal's primary interest in Angola quickly turned to the slave trade. The slaving system began early in the 16th century with the purchase from African chiefs of people to work on sugar plantations in Sao Tome, Príncipe, and Brazil. Many scholars agree that by the beginning of the 19th century, Angola was the largest source of slaves not only for Brazil, but also for the Americas, including the United States. By the end of the 19th century, a massive forced labor system had replaced formal slavery and would continue until outlawed in 1961. It was this forced labor that provided the basis for development of a plantation economy and, by the mid-20th century, a major mining sector. Forced labor combined with British financing to construct three railroads from the coast to the interior, the most important of which was the transcontinental Benguela railroad that linked the port of Lobito with the copper zones of the Belgian Congo and what is now Zambia, through which it connects to Dar es Salaam, Tanzania. Colonial economic development did not translate into social development for native Angolans. The Portuguese regime encouraged white immigration, especially after 1950, which intensified racial antagonisms. As decolonization progressed elsewhere in Africa, Portugal, under the Salazar and Caetano dictatorships, rejected independence and treated its African colonies as overseas provinces. Consequently, three independence movements emerged: the Popular Movement for the Liberation of Angola (MPLA), led by Antonio Agostinho Neto, with a base among Kimbundu and the mixed-race intelligentsia of Luanda and links to communist parties in Portugal and the East Bloc; the National Front for the Liberation of Angola (FNLA), led by Holden Roberto, with an ethnic base in the Bakongo region of the north and links to the United States and the Mobutu regime in Kinshasa; and the National Union for the Total Independence of Angola (UNITA), led by Jonas Malheiro Savimbi, with an ethnic and regional base in the Ovimbundu heartland in the center of the country and links to the People's Republic of China (P.R.C.) and apartheid South Africa. From the early 1960s, elements of these movements fought against the Portuguese. A 1974 coup d'etat in Portugal established a military government that promptly ceased the war and agreed, in the Alvor Accords, to hand over power in Angola to a coalition of the three movements. The ideological differences among the three movements eventually led to armed conflict, with FNLA and UNITA forces attempting to wrest control of Luanda from the MPLA, and all parties supported by their respective international supporters. The intervention of troops from South Africa on behalf of UNITA and Zaire on behalf of the FNLA in September and October 1975 and the MPLA's importation of Cuban troops in November of that year effectively internationalized the conflict. Retaining control of Luanda, the coastal strip, and increasingly lucrative oil fields in Cabinda, the MPLA declared independence on November 11, 1975, the day the Portuguese abandoned the capital. UNITA and the FNLA formed a rival coalition government based in the interior city of Huambo. Agostinho Neto became the first president of the MPLA government that was recognized by the United Nations in 1976. Upon Neto's death from cancer in 1979, then-Planning Minister Jose Eduardo dos Santos ascended to the presidency. On April 4, 2002, the Angolan Government and UNITA signed the Luena Memorandum of Understanding (MOU), which formalized the de facto cease-fire that prevailed following Savimbi's death. In accordance with the MOU, UNITA recommitted to the peace framework in the 1994 Lusaka Protocol, returned all remaining territory to Angolan Government control, quartered all military personnel in predetermined locations, and relinquished all arms. In August 2002, UNITA demobilized all military personnel, and the UN Security Council sanctions on UNITA were lifted on December 9, 2002. UNITA and the MPLA held their first post-war party congresses in 2003. The UNITA Congress saw the democratic transfer of power from interim leader General Paulo Lukumba "Gato" to former UNITA representative in Paris Isaias Henrique Samakuva, while the MPLA Congress reaffirmed President dos Santos' leadership of party structures. Samakuva was reelected to a second 4-year term as UNITA party president at a UNITA party congress in July 2007. Founded in 1963, the Front for the Liberation of the Enclave of Cabinda (FLEC) fought for the enclave's independence from the Portuguese. Upon Angola's independence, MPLA forces gained control over Cabindan cities and oil resources, and the FLEC insurgency continued in predominately rural areas. The signing of the Memorandum of Understanding (MOU) for Peace and Reconciliation in Cabinda on August 1, 2006 was intended as a step toward ending conflict in Cabinda and in bringing about greater representation for the people of Cabinda. It followed a successful counterinsurgency campaign by the Angolan Armed Forces (FAA), which still maintain a strong troop presence there. The MOU rejected the notion of Cabindan independence, called for the demobilization and reintegration of former FLEC fighters into various government positions, and created a special political and economic status for the province of Cabinda. Many FLEC military combatants were integrated into the Angolan Armed Forces and National Police, including into some command positions. In addition, Cabindans were given a designated number of vice ministerial and other positions in the Angolan Government. Some FLEC members who did not sign onto the peace memorandum continue their independence efforts through public outreach, infrequent low-level attacks against FAA convoys and outposts, and occasional violent attacks on civilians. Angola is governed by a president, vice president, and 90 appointed ministers, deputy ministers, and state secretaries. Political power is concentrated in the presidency. The executive branch of the government is composed of the president (head of state and government), the vice president, ministers of state, and the Council of Ministers. The Council of Ministers, composed of all government ministers and secretaries of state, meets regularly to discuss policy issues. The president, the Council of Ministers, and individual ministers in their areas of competence have the ability to legislate by decree. Of the 220 deputies currently seated in the National Assembly, 130 are elected at large, and 5 are elected to represent each of the 18 provinces. The electoral law also calls for the election of three additional deputies to represent citizens living abroad; however, those positions have not been filled. Angola held legislative elections on September 5, 2008, its first since 1992. Due to technical difficulties on election day, voting was extended through September 6 in some constituencies. The results of the elections were accepted by UNITA and most other opposition parties. The MPLA won 81.6% of the electorate, giving it an absolute majority with 191 out of 220 seats in parliament. The remaining 29 parliamentary seats were won by the National Union for the Total Independence of Angola (UNITA) (16), the Social Renewal Party (PRS) (8), National Front for the Liberation of Angola (FNLA) (3), and the New Democracy (ND) coalition (2). Angola enacted a new constitution on February 5, 2010 and on February 8, President dos Santos swore in a new government. The new constitution established a party list system under which citizens vote for a party (not an individual candidate) and the president will be the leader of the winning party's list. It also introduced a new office of the vice president, and eliminated the position of prime minister. The next presidential and parliamentary elections are expected to take place in late 2012. Although President dos Santos has not formally declared his candidacy, most commentators expect him to run. There are no local, municipal, or provincial elections in Angola and no clear timeline for such elections; the new constitution states only that such institutions should be established "gradually." The country is divided into 18 provinces. Governors of the provinces are appointed by and serve at the pleasure of the president. The government has embarked on a program of decentralization, and in August 2007 the Council of Ministers passed a resolution to grant some municipalities control of their own budgets; this measure was extended to all municipalities in 2008. The legal system is based on Portuguese and customary law but is weak and fragmented. Courts operate in only a fraction of the 164 municipalities. A Supreme Court serves as the appellate tribunal; a constitutional court was established in May 2008. The 27-year civil war ravaged the country's political and social institutions. Daily conditions of life throughout the country mirror the inadequate administrative infrastructure as well as inadequate social institutions, for which government support is often weak. Many hospitals are without medicines or basic equipment, schools are without books, and public employees often lack the basic supplies for their daily work. The government estimates that 4.7 million people were internally displaced by the civil war. In March 2007, the UN High Commissioner for Refugees (UNHCR) and Angola jointly celebrated the end of a 5-year organized voluntary repatriation program that returned home more than 400,000 Angolan refugees. According to the UNHCR, 146,814 refugees remained outside Angola, mainly in Democratic Republic of the Congo, Republic of the Congo, and Namibia. Although 52,000 of these refugees are supposed to return by the end of 2011, when UNHCR will apply the cessation clause for their refugee status, Angola is not expected to meet this figure. Minister of State and Head of Military Affairs Cabinet: Manuel Helder Vieira Dias, Jr.
Angola maintains an embassy in the United States at 2100-2108 16th St., NW, Washington, DC 20009 (tel. 202-785-1156; fax 202-822-9049; web: (http://www.angola.org/). Angola also maintains consulates in New York City (attached to its Permanent Mission to the United Nations) at 866 UN Plaza, 48th St., Suite 552, New York, NY 10017 (tel. 212-233-3588, ext. 15; fax 212-980-9606) and in Houston at 3040 Post Oak Blvd., Suite 708, Houston, TX 77056 (tel. 713-212-3840; fax 713-212-3841). Despite a rapidly-growing economy due to petroleum production and post-war reconstruction, Angola ranks in the bottom 10% of most socioeconomic indicators. GDP growth in 2009 was flat due to significantly lower oil prices owing to the global financial crisis. According to the International Monetary Fund (IMF), GDP growth in 2011 was projected at around 7.8%, with a continued pick-up in the pace expected for 2012, barring another global financial crisis. Higher than expected oil prices provided a significant short-term boost to government revenues, and international reserves recovered strongly in 2011, reaching a record U.S. $24 billion in June. Angola is still recovering from 27 years of nearly continuous warfare, and is slowly beginning to tackle problems of corruption, lack of transparency and economic mismanagement. Despite abundant natural resources and rising per capita GDP, it was ranked 146 out of 169 countries on the 2010 UN Development Program's (UNDP) Human Development Index. Agriculture (primarily subsistence) accounts for 80% of the work force. The Organization of Petroleum Exporting Countries (OPEC) cut Angola's production target to 1.51 million barrels per day (bpd) in January 2009 in response to plummeting oil prices. Throughout 2009, Angola never got down to its OPEC quota and produced an average of 1.8 million bpd, and OPEC has not tried to enforce the quota. As of December 2010, Angola was Africa's largest oil producer, a position that Angola and Nigeria had traded places on back and forth over the preceding year. By mid-2011 Angola was producing at a level well below its peak capacity — about 1.6 million bpd, compared to an estimated capacity of 1.9 million bpd, due to technical problems. Oil production was expected to recover in the latter half of 2011, helped by the start-up of the 220,000 bpd Pazflor deepwater field. Estimates of Angola's proven oil reserves range from 9.5 billion to 13.5 billion barrels. In 2010, Angola exported close to 1.8 million bpd of crude oil. Crude oil accounted for roughly 50% of GDP, 95% of exports, and 72% of government revenues in 2010 according to the IMF. Angola also produces 40,000 bpd of locally refined oil. Oil production remains largely offshore and has few linkages with other sectors of the economy, though a local content initiative promulgated by the Angolan Government requires oil companies to source from local businesses and increase the number of Angolan staff. Angola has one refinery (in Luanda) operated by sole owner Sonangol, the state-owned oil company and regulator. There are plans to increase capacity of the Luanda refinery from 40,000 bpd to 100,000 bpd. Decade-old plans for construction of a second refinery in Lobito with projected production of 200,000 bpd are proceeding slowly due to financing difficulties, although U.S. company KBR has been selected for the front-end engineering and design work. A consortium of Chevron, Sonangol, BP, Total, and Eni are developing a $5 billion liquefied natural gas plant at Soyo to take advantage of Angola's estimated 25 trillion cubic feet of natural gas reserves. Construction by Bechtel began in February 2008 and the plant is scheduled to begin production in February 2012. In January 2011, Sonangol announced the results of a restricted tender for exploration of the pre-salt layer in 11 blocks off the central coast of Angola. Cobalt International Energy was awarded an operatorship in block 20 and a stake of 40%, and ConocoPhilips was awarded operatorship and stakes of 30% in blocks 36 and 37. Sonangol has an interest in all blocks. In 2010, Angola was China's second-leading source country for crude oil by volume, providing 790 million barrels, after Saudi Arabia (890 million barrels). The United States was the second major destination for Angolan oil exports, importing close to 400 million barrels and making Angola one of the top sources for U.S. oil imports. Diamonds make up most of Angola's remaining exports. The financial crisis severely depressed diamond prices in 2009, sharply curtailing Angola's diamond exports, and at one point forcing the state diamond authority, Endiama, to buy up production at cost for stockpiling to keep operators going. In 2010, diamond production in Angola reached 8.5 million carats, representing revenues estimated at $995 million. Despite increased corporate ownership of diamond fields, much production is currently in the hands of small-scale prospectors, often operating illegally. Eight large-scale mines operate out of a total of 145 concessions. The government is making an increased effort to register and license prospectors while decreasing production by informal prospectors. In 2011 Angola passed a new law for the mining sector. Legal sales of rough diamonds may occur only through the government's diamond-buying parastatal, although many producers continue to bypass the system to obtain higher prices. The government has established an export certification scheme consistent with the Kimberley Process to identify legitimate production and sales. Other mineral resources, including gold, remain largely undeveloped, though granite and marble quarrying has begun. In the last decade of the colonial period, Angola was a major African agricultural exporter. Because of severe wartime conditions, including the massive dislocation of rural people and the extensive laying of landmines throughout the countryside, agricultural activities came to a near standstill, and the country now imports most of its food. Small-scale agricultural production has increased several-fold over the last 5 years due to demining efforts, infrastructure improvements, and the ability of returnees and internally displaced persons (IDPs) to return safely to agricultural areas, yet production of most crops remains far below 1974 levels. Some efforts at commercial agricultural recovery have gone forward, notably in fisheries and tropical fruits, but most of the country's vast potential remains untapped. Recently proposed land reform laws attempt to reconcile overlapping traditional land use rights, colonial-era land claims, and recent land grants to facilitate significant commercial agricultural development. However, the lack of clear title to land tracts and burdensome registration process in Angola continues to be a significant impediment to foreign investment in the agriculture sector. In November 2009, following increased Angolan efforts to make oil revenues more transparent, the IMF approved a 27-month Stand-by Arrangement (SBA) with Angola in the amount of approximately $1.4 billion to help the country cope with the effects of the global economic crisis. In June 2011, a visiting IMF team concluding its fifth review stated that "performance under the SBA through end-March 2011 saw considerable progress in the implementation of the government stabilization and reform agenda." A new private investment law adopted in 2011 provides certain benefits and incentives for investors. The threshold for such incentives was increased from investments of $100,000 under the old law to $1 million. Concerns remain about quasi-fiscal operations by the state oil company Sonangol, opaque oil-backed concessionary lines of credit, primarily from China, that operate outside the budget process, inadequate transparency, oversight in the management of public accounts, and the lack of supervision of the commercial banking sector. In 2010, the National Assembly passed a new law to combat money laundering and terrorist financing. In 2011, the government established a Financial Intelligence Unit to implement provisions of the new law. A recent Financial Action Task Force on Money Laundering (FATF) report recognized that Angola had taken steps toward improving its AML/CFT (anti-money laundering and combating the financing of terrorism) regime. The Angolan commercial code, financial sector law, and telecommunications law all require substantial revision. Angola is the second-largest trading partner of the United States in sub-Saharan Africa, mainly because of its petroleum exports. U.S. exports to Angola primarily consist of industrial goods and services — such as oilfield equipment, mining equipment, chemicals, aircraft, and food. Angola is eligible for tariff preferences under the African Growth and Opportunity Act (AGOA). The Angolan Armed Forces, known by their Portuguese acronym FAA, are headed by a chief of staff who reports to the Minister of Defense. There are three services — the army, navy, and air force. The army is by far the largest of the services, with about 110,000 personnel. The navy numbers about 3,000 and operates several small patrol craft and barges. Air force personnel total about 7,000; equipment includes Russian- and Brazilian-manufactured fighters and transport planes and some Bell helicopters. The "Casa Militar," or Military Affairs Cabinet, is headed by one of the two Ministers of State and answers directly to the Office of the President. From 1975 to 1989, Angola was aligned with the Soviet Union and Cuba. Since then, it has focused on improving relationships with Western countries, cultivating links with other Portuguese-speaking countries, and asserting its own national interests in Central Africa through military and diplomatic intervention, though ties with Cuba remain strong. Angola joined the Southern African Development Community (SADC) in order to improve ties with its largely Anglophone neighbors to the south and east. 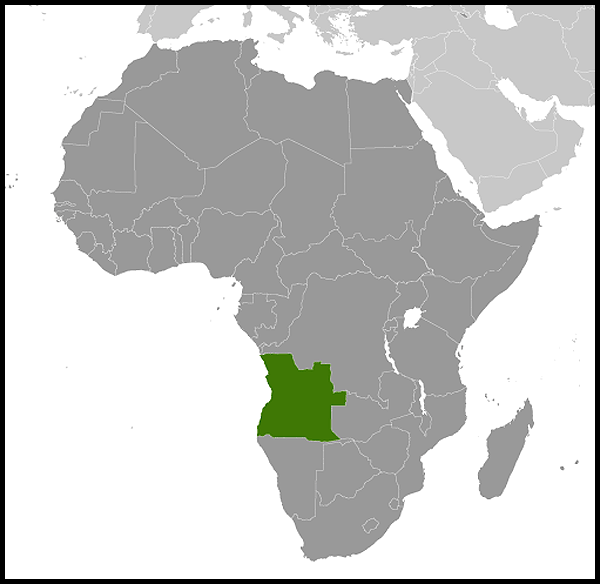 Angola holds the SADC presidency from September 2011 to September 2012. Multilaterally, Angola has promoted the revival of the Community of Portuguese-Speaking Countries (CPLP) as a forum for cultural exchange and a means of expanding ties with Portugal and Brazil. 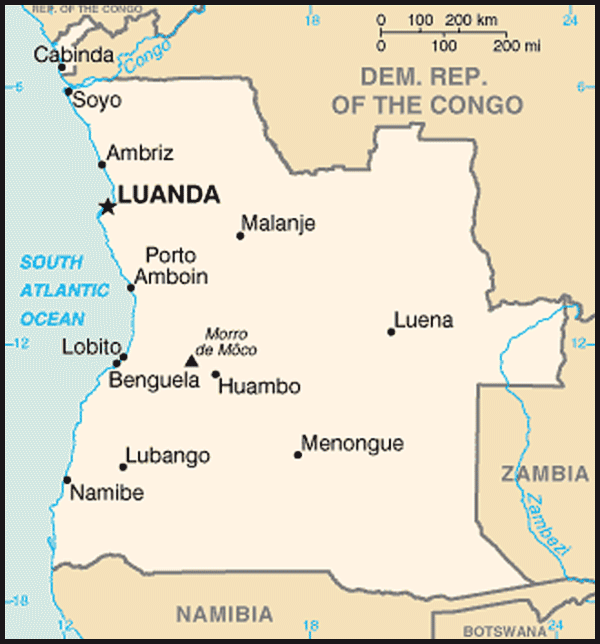 The U.S. Mission in Angola encompasses four agencies — the Department of State, the U.S. Agency for International Development (USAID (http://www.usaid.gov/), the Department of Defense, and the Department of Health and Human Services/Centers for Disease Control and Prevention (HHS/CDC). In addition, a variety of federal agencies maintain relationships with the Angolan Government, including the Federal Aviation Administration, the Department of the Treasury, the Department of Transportation, the Department of Commerce, the U.S. Trade and Development Agency, and the Department of Energy. The United States and Angola established formal diplomatic relations in 1993. Since the civil war's end in 2002, United States foreign policy goals in Angola have been to promote and strengthen Angola's democratic institutions, promote economic prosperity, improve health, and consolidate peace and security. The U.S. has worked in partnership with Angola to remove thousands of landmines and help war refugees and internally displaced people return to their homes. USAID's development program focuses on overcoming the many challenges Angola faces — reflected in its poor social indicators, weak democratic structures, and relative lack of transparency — to help create a country that is prosperous, democratic, healthy, peaceful, and secure. The health sector continues to be a priority. In August 2009, U.S. Secretary of State Hillary Clinton and Angolan Foreign Minister Assuncao dos Anjos signed an agreement under the President's Emergency Plan for AIDS Relief (PEPFAR) Partnership Framework, which resulted in PEPFAR financing more than doubling, from $7 million to $17.7 million in 2010, of which USAID implemented about $10 million. Angola was selected as one of the first three countries in the President's Malaria Initiative and the program, active in Angola since June 2005, received $35 million in 2010. In 2010, USAID also received $4 million for family planning and reproductive health activities and provided $1,350,000 to combat polio. In the democracy sector, with 2010 assistance of $6.2 million, USAID supported municipal government and civil society to improve access to essential services and the planning and implementation of public resources. 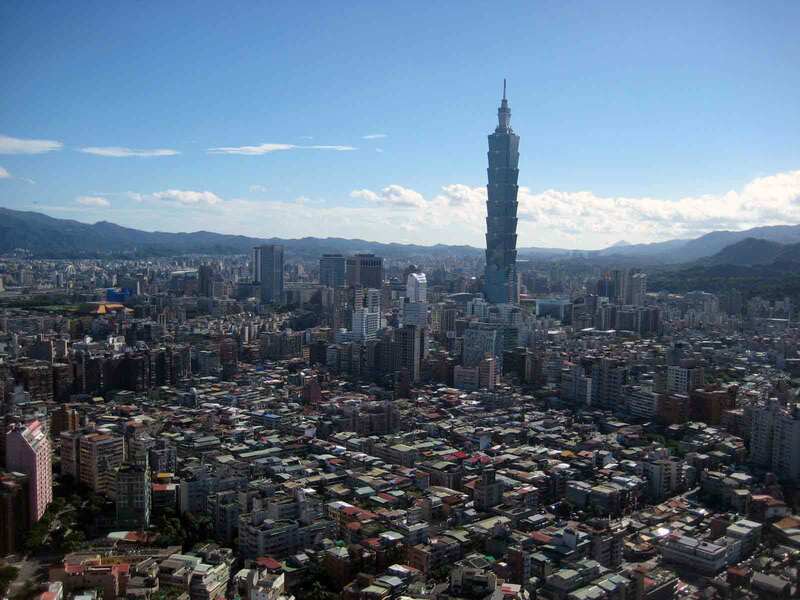 In the economic growth sector, U.S. assistance of $8.9 million in 2010 supported the Central Bank and Ministry of Finance to improve transparency in fiscal policy, and strengthen trade and investment through policy reform. As part of the Barack Obama administration's Feed the Future initiative, U.S. assistance in agriculture supported more than 8,600 farmers, cooperatives, and agribusinesses, particularly those working in coffee and bananas. Efforts improved their production capacities and increased access to more than $4 million in loans. In 2011, $314,000 in International Military Education and Training (IMET) funds supported English-language training for the Angolan Armed Forces. Professional training for law enforcement personnel at the International Law Enforcement Academy (ILEA) in Gaborone, Botswana continued. As part of its public diplomacy program, the Embassy underwrote nearly $500,000 in English-language training, educational exchanges and fellowships, and information resource services. The State Department funded ongoing landmine, small arms, and munitions destruction projects throughout the country, for a total value of $6 million. These projects have played a major role in clearing agricultural land, opening critical road networks, and increasing access in those areas of the country most impacted by landmines. The U.S. and Angola signed a Trade and Investment Framework Agreement in May 2009, which seeks to promote greater trade and investment between the two countries. One meeting has taken place under the TIFA, in June 2010. Secretary Clinton visited Angola in August 2009, and in July 2010 signed an agreement for a Strategic Partnership Dialogue with the Angolan Foreign Minister in Washington, opening a new chapter in bilateral ties between the two countries.